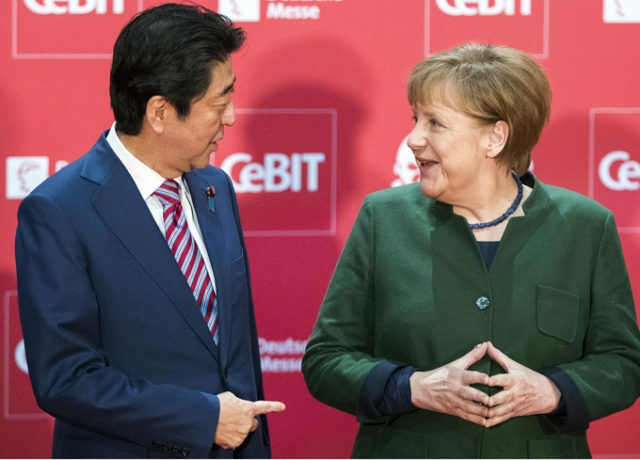 Japanese Prime Minister Shinzo Abe briefly crossed paths with German Chancellor Angela Merkel yesterday asking if she’ll be pouring the beers during the G20 summit. Abe held legitimate concerns for the smooth running of the G20 Hamburg summit given the lack of female participants. “At the G7 summit last year we had Angela pouring the beer for six men, but this year there is an extra 12 men,” said Abe. “I asked Theresa May earlier in the day, but she didn’t seem too receptive to the idea,” Abe told reporters. Abe decided to get in early with his drink order and let Merkel know he would probably prefer a pale ale. “I’m thinking I might go with the pale ale, thanks Angela,” Abe told Merkel. The saddest part is that they can’t hide their stupidity in front of the world. Ummmm, it was a joke…..